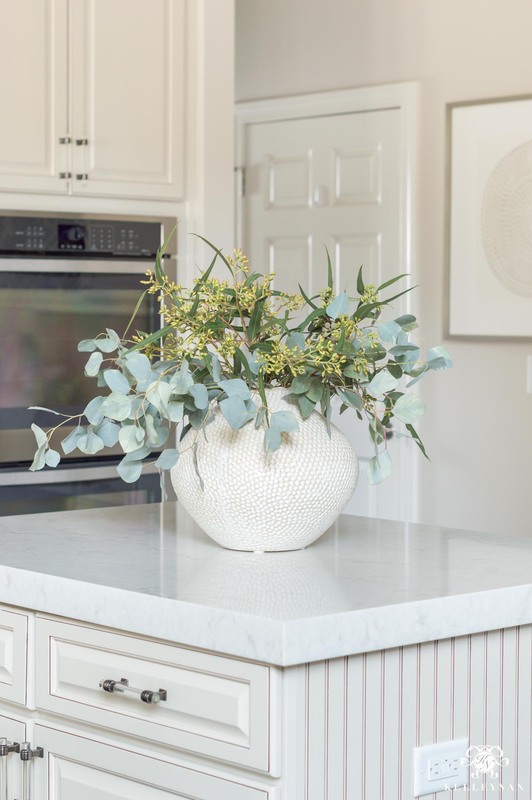 One of the most common requests I receive is to create a post with tips on styling a specific surface — a console table, coffee table, buffet, and last but not least, a kitchen island. The short answer is simple; I play around until I land on something I like. The more thorough answer, well… read on 😉 Over the years, I’ve come up with a pattern/theme — a formula of sorts — to help guide me. 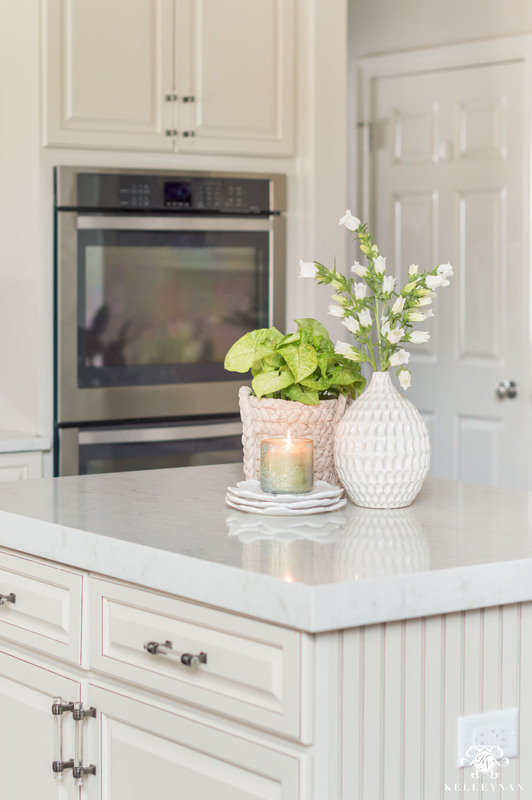 Today, I’m sharing my thought process when it comes to kitchen island decor and am dishing up my best tips, especially when it comes to a spring refresh in the kitchen. 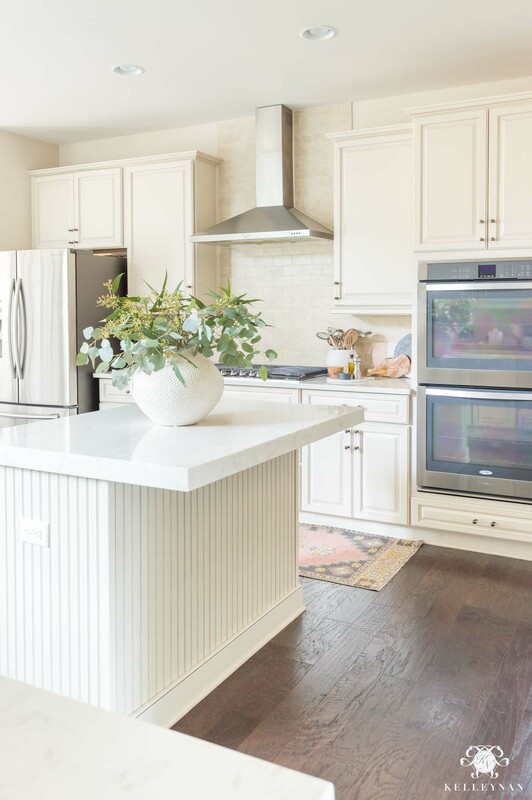 One of my main goals isn’t just to keep physical clutter, but also visual clutter to a minimum in the kitchen. I don’t have a large, spansive island but even if I did, I wouldn’t view it as a space that needed to be filled. 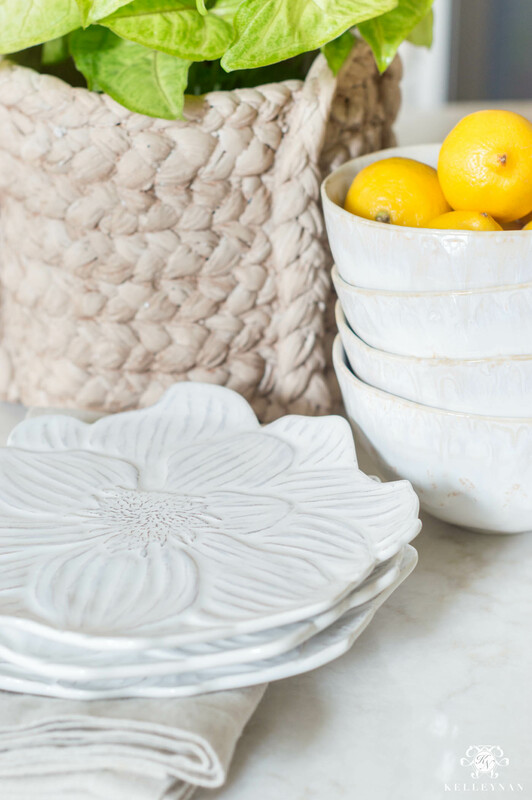 Whether it’s a bowl of fruit or a floral arrangement, sometimes it’s best to not overthink it and keep your kitchen decor simple by sticking to one item. 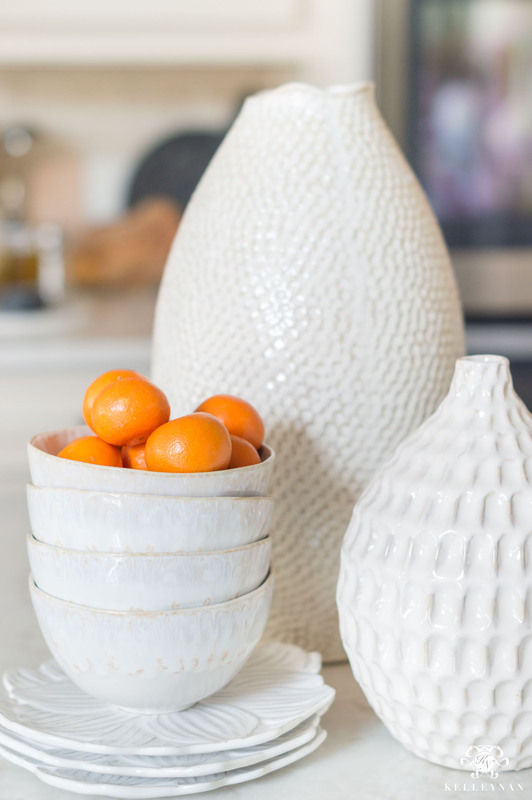 Out of all the accessories and pretty entertaining pieces I’m sharing in this post, the Eva Round Vase is easily in my top three favorites. I wish you could jump through the photo and into my kitchen to see how big she really is — perfect and substantial enough for hoards of eucalyptus or long, leggy spring branches from the yard. When you have something that makes this much of a statement, you need nothing else. It serves as the centerpiece and focal point of the entire kitchen. And, I am so here for it. But even if you don’t have enough foliage on hand or if your outdoor blooms are still in hibernation mode, you can scale it back a bit and stick to something a little more simple. 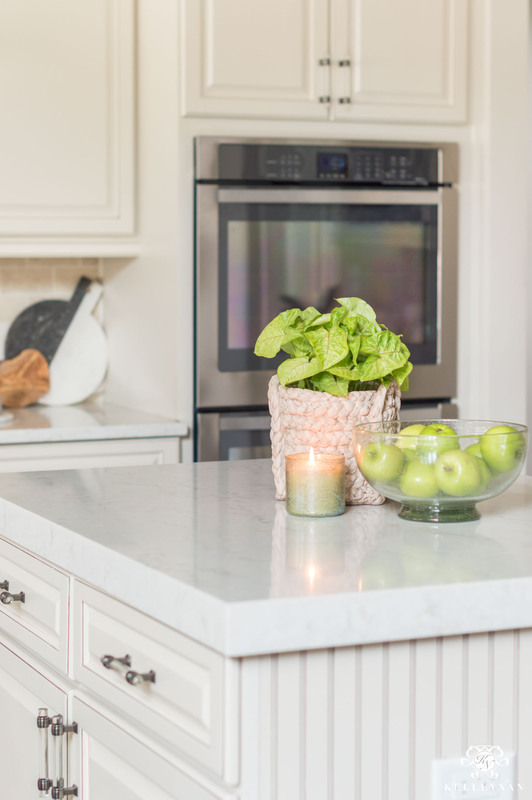 This green-tinted, hand blown glass bowl (HERE) is large enough to stand on its own and provides virtually zero obstruction to the countertop prep space. If you’ve been a reader for awhile, you know I’m really big on investing in pieces that are versatile enough to transcend seasons (and can be moved throughout the house from room to room). For that reason, instead of going season-specific on a lot of items I’ll have to find storage space for, I tend to try to bring in seasonal feels through produce and plants. 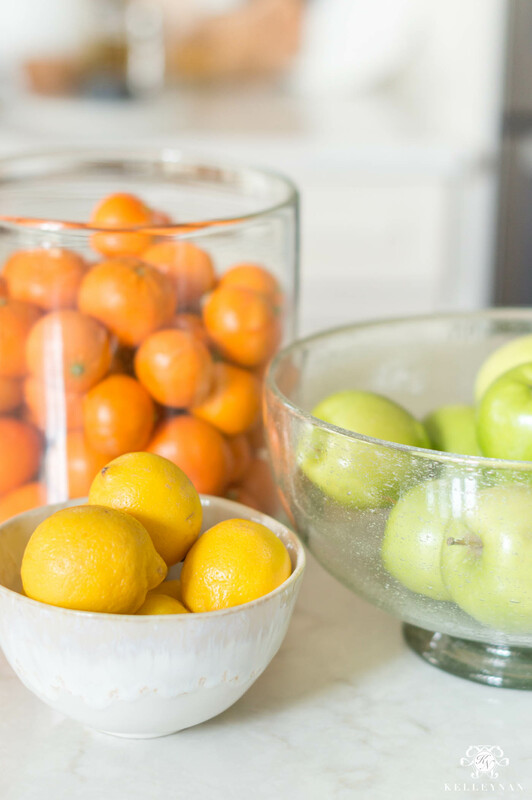 The neutral vessels I loaded up on at Arhaus have already been serving me well leading up to spring, but with just a few fruit and flower switches, they’d be ready to go in any season. Full disclosure — I ordered the Woven Long-Handle Planter (HERE), not paying attention to the name, thinking it was an actual basket (that I was intending to use as a small kitchen countertop planter.) It actually is a planter, made of cement, which I LOVE! 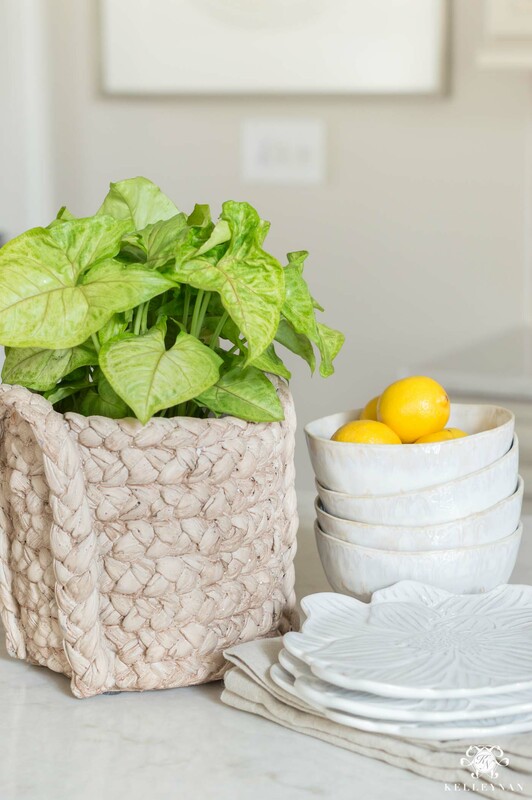 You can find a different basket-style planter HERE that looks like it’s a woven roll-top version. I’m sure you’ve heard the “rule of threes” and how things typically look better grouped in odd numbers. (PS: there’s always exceptions and sometimes, I totally break this “rule” 😉 ). Well, the same goes for kitchen counter decor vignettes. I like to imagine I’m sort of nestling items together — items at varying heights, shapes, and textures. I like things to be staggered. But, what I don’t want to do is end up rendering the island countertops totally unusable. So, I try to stick to no more than three items sitting on the actual countertop. The Eva Round Vase from earlier in the post is a part of the same collection as the Eva Tall Vase and Eva Bud Vase pictured here. I’m looking forward to trying all three on my living room built-ins, with the large round vase on top of one shelf, and the tall and bud vase on top of the second shelf. 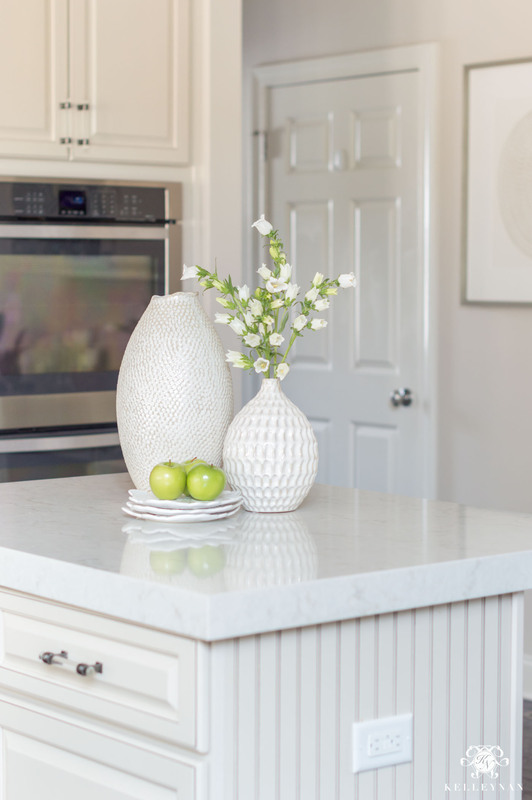 You can layer and stack vertically if the vignette calls for it but once you go past three main items on the actual counter surface, it can start getting a little over-crowded. 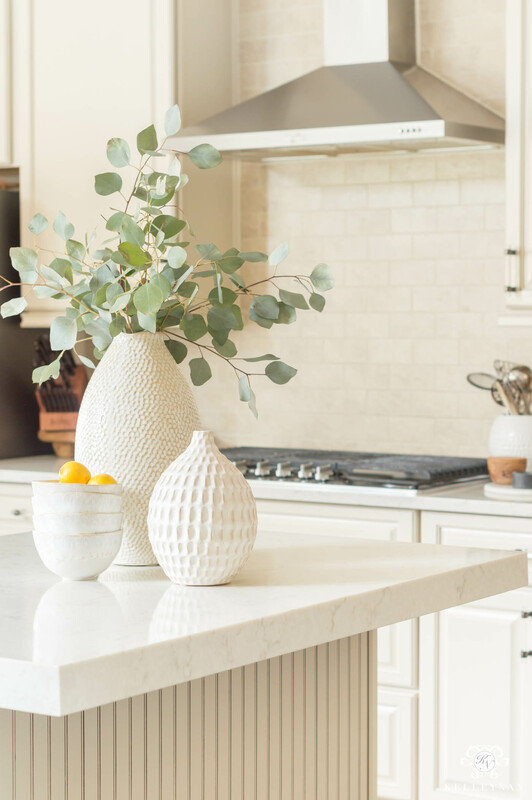 Because kitchen countertops are already at a premium — and let’s be honest, so are the kitchen cabinets — I like to identify opportunities to display some of my favorite dinnerware/kitchen pieces in my sideboards, on my bar cart, and on the kitchen counters. I also think that because we’re trying to steer clear of clutter, that unless they’re vessels or serving a purpose, I’m not really into bringing in a bunch of random decor that could be better served being displayed in a different room. This is when you can bring out those fun patterns and shapes that may only see a rare party occasionally. And even though I don’t get too season-specific on many items, this collection of bloom plates is adorable! You can see all the sizes and types of blooms HERE. I went for the small plates (HERE) that can be used for salad salad, dessert, and sides, and easily topped on a dinner plate at a place setting in the dining room. The varying hues of these organic shaped cereal bowls blend all the colors of my kitchen; you can see how perfect they look with my quartz countertops. Display your collection of hand blown glass jugs, ginger jars, blue and white pieces, or your grocery haul. 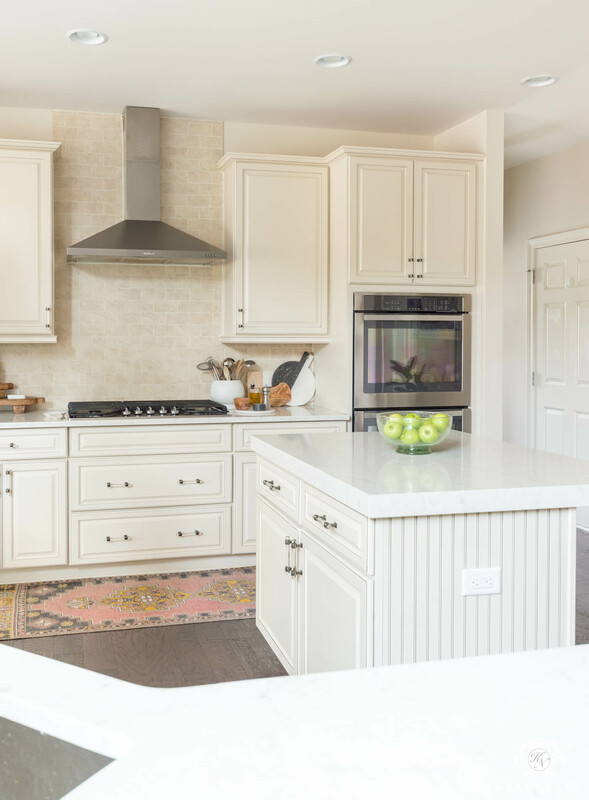 Whether you use coordinating vessels to hold your collection, or the vessels are your collection, similar groupings in the center of the kitchen can make a strong visual impact. Look for similarities and group accordingly. 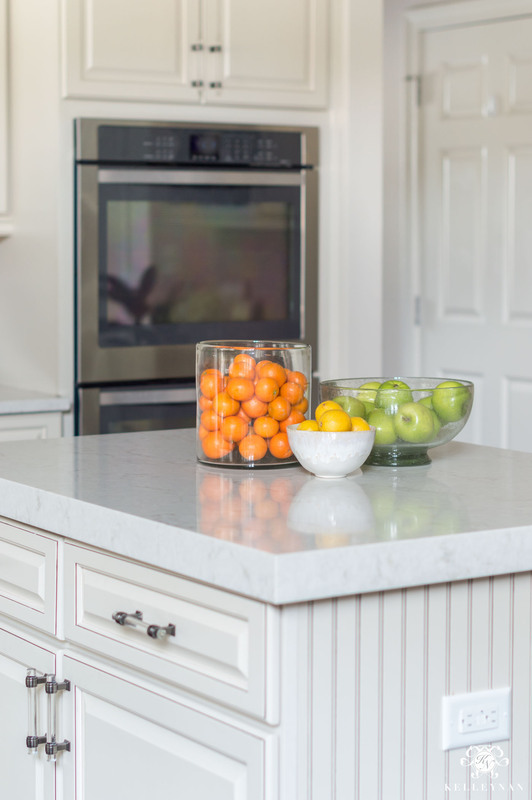 And if the items in your kitchen island grouping don’t have much in common? No problem. Corral them on a tray and just like that, it all makes sense! 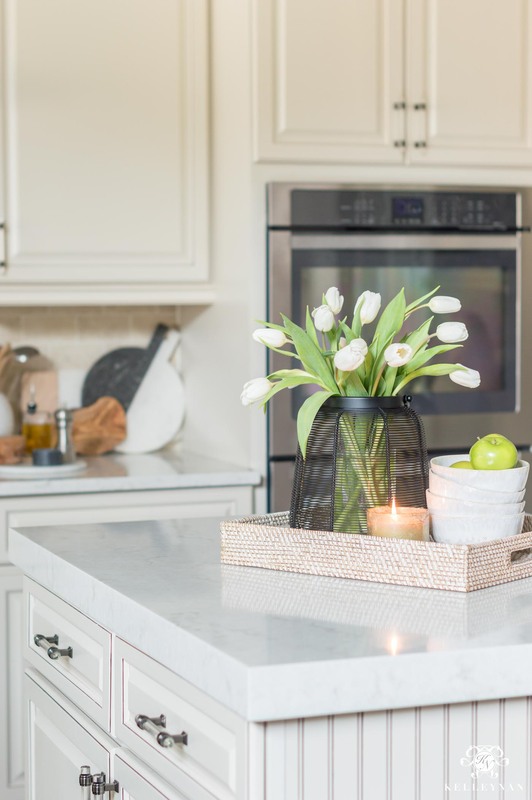 Sure, there are some commonalities between the greens and spring vibes of the tulip/apple combo below but with the matte black lantern, bowls, and shiny candle, there’s a lot going on. Keeping them grouped in a tray makes it feel more intentional, not just like they’re taking up counter space temporarily. As a bonus, if you have pieces that lack height or look slightly puny grouped together, putting them in a tray will make it feel instantly larger. By the way, I love using lanterns as vases (THIS ONE does come with a glass insert that I filled with water). You can see my post on other lantern flower arrangements HERE. Now that spring is officially here, have you started transitioning your home? I have some major work to do (my front door is still winter and my urns are naked), but I’ll be sharing some ways I’ve incorporated spring into my office next week! 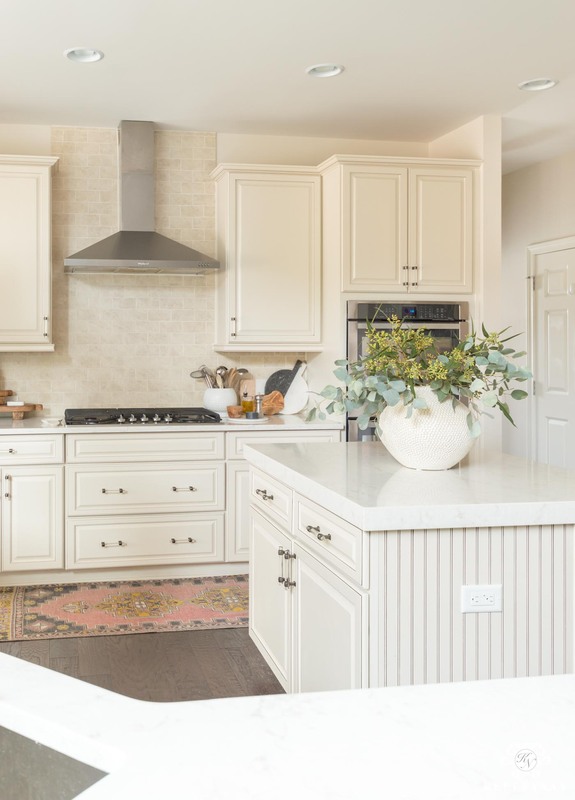 For all the kitchen colors, finishes, materials and sources, visit my kitchen reveal post HERE. Be sure to subscribe to my emails at the bottom of this post for fun projects ahead. I’ll be sharing seasonal decor, warm weather recipes, baby “things”, organization, some entertaining, and everything in between! What a great and helpful post! All of the tips and vessels are fabulous! It’s hard for me to pick a favorite, but the cement one…I love it! Very cute! I’m always trying to figure out what to put on my island. It’s 10 feet long and 5 feet wide. And…decor items always are so pricey. Not to mention, I am not at all good at these sorts of things. I see lots of things in Michael’s (also not cheap! ), but just don’t know what goes good together. Ugh! The struggle is real! You have given me some really great ideas! I LOVE the eucalyptus and the tulips in the lantern ! As always, awesome ideas! Hugs!! Love the Eva vases but the round one is going to be living on my island! The texture in these vases is exquisite. Happy Spring Kelley! So beautiful and such great ideas, Kelley! I ordered this vase!! Kelley, where is your floral from?? This is stunning. I love every single vignette you have created…so tasteful, and simple!